Norbert Bajurin, the owner of an automotive radiator shop in San Francisco, CA, was initially enthusiastic about being elected Commodore of his beloved Golden Gate Yacht Club, but he soon realized the blue collar club was in dire financial straits and in danger of being forced out of existence. After hearing that the neighboring St. Francis Yacht Club had turned down Oracle CEO Larry Ellison’s proposal for sponsorship of his America’s Cup campaign, Bajurin (pronounced “Byron”) hatched a plan to sponsor the software titan’s bid for the Cup. 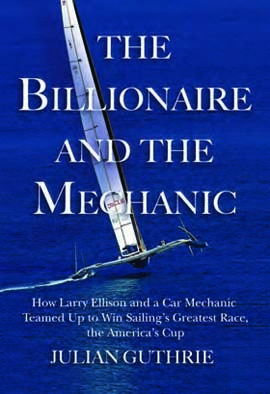 The Billionaire and the Mechanic is compelling from the very first page, as author Julian Guthrie tells the story of Ellison’s harrowing experience during the 1998 Sydney Hobart Yacht Race in which five boats sank and six sailors died. Shortly after that ill-fated race, Ellison set his sights on winning the oldest trophy in sports, the America’s Cup. The improbable partnership of Ellison and Bajurin resulted in three attempts to win the Cup, in 2003, 2007 and finally 2010, the year that Ellison’s BMW Oracle Racing team, representing the Golden Gate Yacht Club, defeated the Swiss Alinghi syndicate in the waters off Valencia, Spain. Comprehensively researched and vividly written, The Billionaire and the Mechanic provides insight into one man’s astonishing will-to-win and another’s desire to make a humble yacht club the envy of the international sailing community. It’s worthy of a place in every sailor’s library. Julian Guthrie is an award-winning journalist and staff writer at the San Francisco Chronicle. She is the author of The Grace of Everyday Saints: How a Band of Believers Lost Their Church and Found Their Faith. Her feature writing and enterprise reporting have been nominated multiple times for the Pulitzer Prize. Visit julianguthriesf.com to learn more. Small Trimarans are Taking Off!